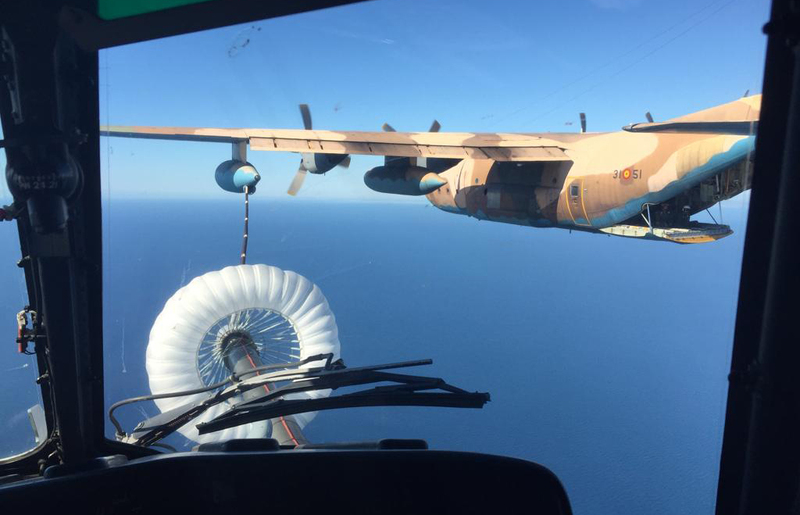 According to a statement released on October 15, the Ejército del Aire (EdA, Spanish Air Force) has successfully completed initial air-to-air refueling (AAR) trials with the Airbus Helicopters H225M Caracal helicopter of the Armée de l'Air (AA, French air force), as the two NATO nations look to boost interoperability on operations. The trials used a KC-130H (locally designated TK-10) from the EdA’s Ala 31 (31st wing) based in Zaragoza in northern Spain. Flights took place between October 1 and 5 and were conducted from Istres air base in the south of France. In Spanish service, the TK-10 Hercules aircraft are mainly used to pass fuel to the air force’s Eurofighter Typhoon and Boeing F/A-18 fleet, and not generally employed for refueling helicopters. According to the EdA, the H225M trials required modifications to the Hercules’s refueling drogues to permit operation at slower speeds of between 137 and 161 mph (220 and 260 km/h). A C-295 transport from Ala 35 (35th wing) also participated in the trials “to become familiar with the specific helicopter flight replenishment procedures.” The testing is understood to have achieved its desired results and the next step could be extending the flight campaign to more challenging evening conditions. With initial tests successfully completed, Spain effectively becomes the latest air force that the AA can call upon to refuel its 11-tonne twin-turbine H225Ms mid-flight. That is particularly useful for France, which is one of the few nations that not only has this specialist capability but also uses it extensively on operations, most notably in Africa and the Sahel region where French forces operate over vast distances. The H225M’s aerial refueling boom allows it to cover hundreds of miles without landing, which is seen as a key capability for missions such as the rapid insertion or extraction of special forces soldiers. An issue for the AA has been a lack of tanker assets and trained crews to facilitate this specialist mission. It has previously had to use both Aeronautica Militare (Italian air force) KC-130Js and US Air Force MC-130Js for helicopter AAR. For its own national helicopter AAR capability, the AA planned to use its new Airbus A400M fleet as it entered service. That, however, has run into difficulties with officials stating in 2015 that it was "nearly impossible" to refuel helicopters with the A400M without major redesigns. Airbus Defence & Space is expected to carry out flight trials next year of an updated hose design that, it is hoped, will resolve the helicopter AAR issues. Nevertheless, this revelation led to France ordering four C-130Js in 2016 for approximately $355 million through a U.S. Foreign Military Sale, two being configured as KC-130J aerial tankers that are optimized for helicopter refueling. The first C-130J-30 arrived in France in January and the specially configured KC-130Js are expected to be delivered in 2019.